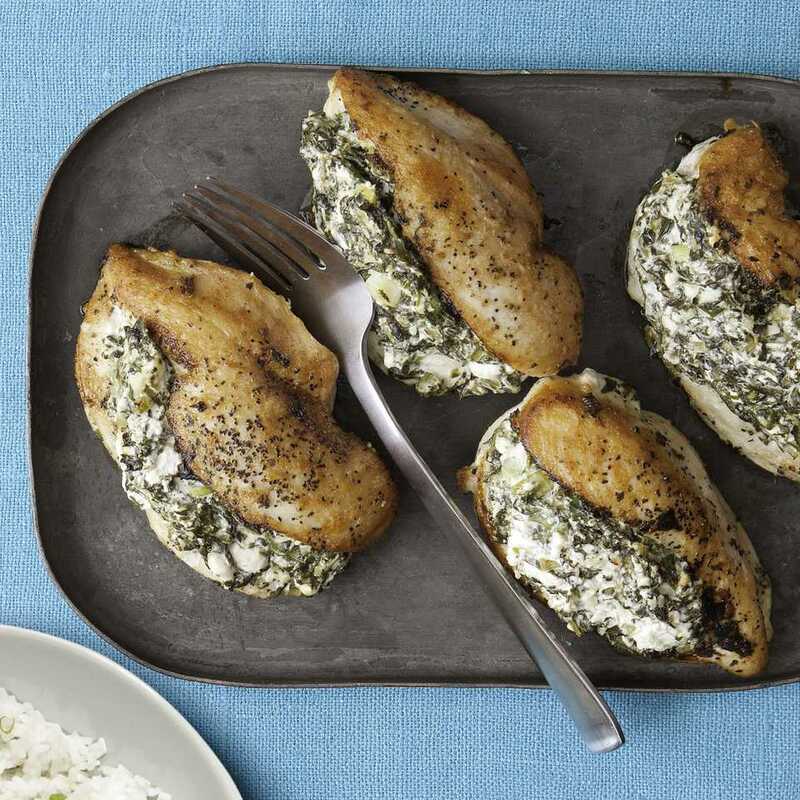 This stuffed chicken thigh recipe utilizes frozen spinach in a delicious way, resulting in a simple yet impressive weeknight dinner. If you need to, you can thaw frozen spinach by leaving it in the fridge overnight, or another way to thaw frozen spinach is to put it in a strainer and run it under warm water. Use your fingers to break apart chunks of frozen spinach. Turn off the water, grab a handful of spinach and squeeze until you get out as much water as possible. Repeat with the rest of the spinach. Heat the butter in a medium-sized skillet over medium heat until melted. Sauté the onion for 2 minutes until tender, then add the spinach, season with salt and pepper, and cook until the spinach is cooked and most of the moisture is evaporated, about 4 minutes. Add the red pepper flakes, if desired, and the cream. Cook for another 3 minutes until the cream has blended into the spinach. Stir in the feta and cool so that it’s just slightly warm or room temperature. Check for seasoning. Loosen the skin from each thigh, and place a couple of tablespoons of the spinach mixture under the skin, spreading it out beneath the skin. Brush the skin with the olive oil, and season with salt and pepper. Roast for about 45 minutes, or until the chicken is cooked through (an internal temperature of 165 F.). Serve hot or warm.